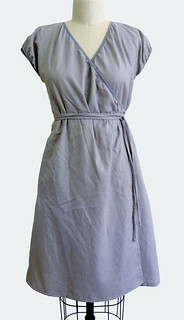 light grey cotton/linen blend with tiny light blue stripe. elastic binding at sleeves and neck. I like the sleeves and neck edge better on this one. but I think I like the drawstring waist better on version I. what do you guys think?